It’s one dream for a hitter to bat 1.000. A goal almost as good is a blogger who hits 1,000 posts. Rob “Spiff” Matlack has done that at his Rangers Cards blog. I spotted some autographs and one surprising correspondence during his first thousand posts. Also, he revealed why he collects one certain player. Q: You collect one certain player. A relative? 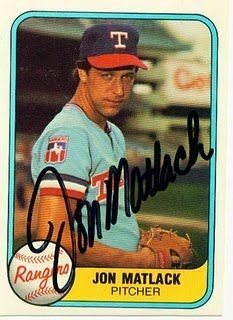 A: Jon Matlack is actually a distant cousin and that is what inspired the collection. I have never met him though. Back in the mid-90’s my younger brother wrote him and asked him if he was a descendant of Timothy Matlack (inscriber of the Declaration of Independence). He wrote back a short note stating that he was and commenting that must make us relations of some sort. I have never let Jon know about my collection of his memorabilia but I have taken to sending him a card to keep each time I write and ask for an autograph. I try to make it a different card each time. Q: What kind of autographs do you collect? A:. I started collecting Rangers autographs in the late 1980’s and early 1990’s when my Grandfather would take my brothers and I to Arlington Stadium. The first ones I got were in person. I later started sending cards to players care of the team after seeing a list of team addresses in Beckett. Only in the past few years have I started sending to players at home. Active Rangers have been decent signers for me in the past. Of course you have to avoid the big names for the most part (Young, Tex, Kinsler) and know who won’t sign (Andrus). Currently Wilson is very good and Hamilton will sign if you give him enough time. A couple of years ago I even got Jon Daniels to sign. There are several others who will also sign. For home addresses I use a section of The Bench forums and other autograph collectors. Q: Do you tell about your blog or your fandom in your letters? A: The letters I send out are usually not very personal. I explain that I am requesting the autograph for my personal collection and thank the player in advance for their time. A particular favorite will get a few additional words. The reason for the shortness of the letter is to save the player time. These guys are signing a lot and doing it as a service to their fans. If the letter is short they don’t have to take much time to read it. Depending on the player I will ask for up to two autographs at a time. Any more falls under the category of why my letters are short. Q: You interviewed a former major leaguer, someone who found you and your blog. How? A: Hearing from Willie Lozado was awesome. Easily one of the high points of my blogging experience. I exchanged several emails with him during the process and he was never anything less than gracious. Very impressed that he would take time from his schedule to answer my questions. Q: Did a Rangers minor leaguer respond to your blog? A: Joe Wardlow is a bit of a mystery. I would love to interview him but am doubtful it will happen. Recently I received an email from a person claiming to be Joe’s cousin. He provided me with enough information that I think it was a legitimate email. The cousin verified that the original comment on my blog came from Joe. He has also passed on my email address to Joe along with a request for an email interview. So far I have not heard anything back. Q: I’ve gotten Rangers Alumni “Legacy” cards autographed from Frank Lucchesi and Rich Billings. What do you know of them? A. I think the alumni cards were/are handed out during autograph appearances and other team sponsored events. Not sure of the time period. I also got a Lucchesi one back with an autograph request. It appears that some players/managers kept a supply to give away. Q: Are any other former Rangers writing? A: I really haven’t gotten too many personal notes back from autograph requests. Kevin Elster’s wife (?) sent some cards back unsigned with a note that he would be gone until a certain date. After that date I resent the cards and he signed them. Billy Sample included a note apologizing for not responding to an earlier request and claiming that the cards must have been lost in his “dungeon”. Several players have included tracts and business cards along with their autographs. Q: Future goals as an autograph collector or blogger? A: Right now I am in a dry spell with the autograph collecting. Haven’t sent out many requests this year. Planning on changing that sometime soon I hope. As far as the blog, I really don’t know. After three and a half years and a little over 1,000 posts I still have a lot to write on. It is time consuming though and there are times that I doubt anyone is reading it. For now I am planning on sticking with it. Can’t see any major changes in the near future but one never knows. Thanks, Rob. I think you and the Rangers have bright futures!